There are only two ways into Machu Picchu. By train and bus or by foot via the Inca Trail. We went with the former option and were on a 5.15am train from Ollantambo to the portal town of Aquas Calientes. If you’re taking the Inca Trail, there are a few options. Either way, you get off of the train or bus a few kilometers before Aquas Calientes and start walking for either 2 or 4-5 days (depending on the speed of the hiker). Once we got off the train we dropped our stuff off at our hostel and headed up a peak called Putucusi. This is a 2,500m peak that is across the Urubamba River from Machu Picchu and offers a neat side view of the Inca city. The 500m climb is steep and it includes a number of built in log ladders that go up through the thick lush rainforest foliage covering the nearly vertical slopes. The sun was starting to appear on the opposite slopes from where we were climbing and it stayed nice and cool in the shade of the mountain under the thick canopy early in the morning. Once we hit 2,400m or so, the canopy broke and we were in the sun. The trail mellowed out and a cool breeze made it an easy push to the top with great views down the twisting river valley all around us. When we made it to the summit, the broad side of Machu Picchu was revealed before us along the ridge tucked between Machupicchu Peak and Waynapicchu Peak. We marveled in the view, basked in the sun and cooled in the breeze for fifteen minutes before exploring beyond the summit of Putucusi down the other side. This only took a few minutes as well and soon we were back on the summit heading down the way we came. We encountered a number of folks who were still heading up and unfortunately for them, the cool morning air had moved on and it was getting very warm in the sun. Back in town, we headed for lunch at a great buffet along the river called Toto’s House where the band Kuntur Taky set up and played some great Peruvian music. We did manage to get the “good friend” price reduction on their audio CD and have been happy with the purchase. That afternoon we walked down to the Machu Picchu Museum which is tucked away on a small spur from the main road to Machu Picchu and way under utilized. It offers a great overview of the Inca life and the history of the discovery of Machu Picchu in Spanish and English. The information would leave a little more to be desired at times, not fully explaining the exhibit, but it certainly provided me with more than I knew about the Incas coming in. After a little siesta, we cruised through the central square, hit the market and had dinner at Indio Felis. This is a pirate themed restaurant that seems to be run by a French ex-pat who loves to have people staple their business cards throughout the restaurant. Mine can be found in the middle of the mantle of the fire place by the front entrance. Let me know if you find it in the comments below! The food was excellent. The first bus to Machu Picchu departs at 5.30am and I was up and at breakfast before 5am. Something did not quite agree with Rob and Dave, so they opted to sleep in and get more rest. When I arrived at the bus stop at 5am there were already 120 people in the long line that ran way up the dark street. I marched my way up, glancing at those who arrived before me. Some were still groggy others peppy and eager to see the ancient city. The main reason I was there for the early bus was to be one of the first 200 people allowed to climb Waynapicchu at 7am. A second batch of 200 would be permitted at 10am. I was on bus #4 up the zig-zag of switchbacks and when my window was facing away from the mountain, I could see the sky begin to lighten down the river valley between the silhouetted steep masses carved out by the Urubamba River. Venus, the morning star sat squarely between the two sides and I began to wish I had opted for the hike up instead of the bus which would have allowed for some interesting photography. Once off the bus we were in another line to get into the city. Here I befriended a French/Spanish couple, Yvette & Jose, who were keen to climb Waynapicchu as well and once in the main gate, they led me through the maze across the city to the Waynapicchu gate. As it turns out I was number 45 in line. Plenty early. A thick morning mist blew through and obscure our view of Waynapicchu peak right before us. Finally, they started to let us through. Each person singing in a log book before heading up the hill. I passed the trail to Huchuypicchu, another smaller peak and figured I’d hit that on my way back. For now, I had my sights set on getting to the top of the 2,634m Waynapicchu for as much of the sunrise that would be left. The mist burned off as I climbed the steep shaded trail, slowly passing a few of the folks before me until I arrived at the base of a steep column of stone steps passing a few small terraces. When I turned around, I got a view not too unlike the one from Putucusi, except now I was looking at Machu Picchu head on and not from the side. A few small remnant patches of cloud were still lingering, but the sun was now in full blaze. After getting my fill of photos the place started to get crowded as the 200 permit holders began to gather at the top with me. I headed down the back side following a sign to the caves. Like with Huchuypicchu, I saw a sign to the caves on the way up and remembered that was the loop. I hadn’t quite fully understood how long the loop trail was. Happy to be away from the crowds again, I had the jungle trail to myself. Unlike the way up, there were a few log ladders built into the steeper sections of the trail. It was obvious nobody had been back here yet today as the birds were still singing in the branches right above the trail until I came along to move them from their perch. I had this side of the mountain to myself. And when I came out from the trees into a small grassy hillside be-speckled with ruins, it felt to me as if I were the first one to ever discover these. They were slightly over grown and they didn’t have those smoothened rounded edges like other parts of the city where millions of greasy dirty hands have touched and slowly worn the stone down. There was indeed a large cave. In it were a few seats carved out of the solid rock, little cubby holes for candles or deities or ceremonial items were built into the rock and stacks of rocks with the same meticulous detail that the Inca were known for made alters and a few small buildings out side of the cave. Again, with my fill of photos, I continued along the trail completing the loop back to the main trail and started to pay for the long descent down the back side of Waynapicchu. This trail felt like it went on and up forever. I still had this secluded jungle trail to myself and I’ve now rounded back to the shady side of the slope. Suddenly, I was out of jungle, because I was now on the side of a cliff. A narrow band of a ledge was etched out of the vertical slab of rock with a solid restraining wall to prevent any falls down the hundreds of meters below. This was a pretty amazing view. Huchuypicchu was blocking any views of Machu Picchu, but to be right up against the steepness of the slope and with views of the Urubamba River, caused me to take a deep breath. Not just to catch my breath, but to pause and absorb the surreal scene around me. I finally made it back to the main trail and blended in with the crowds coming straight down from the Waynapicchu summit. I was again alone when I peeled off to climb Huchuypicchu. Skipping this is probably the biggest mistake most people make when getting in the gate. 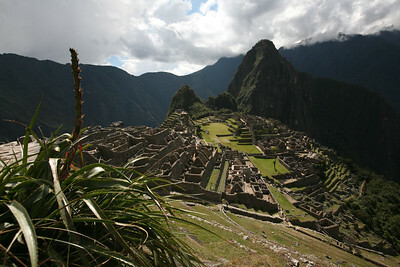 Huchuypicchu provides a much more intimate view of Machu Picchu than either Waynapicchu or Putucusi. At only 2,479m Huchuypicchu is much closer to the main city and you get a great view of the main green, the ceremonial mound and the residential ruins. The city looked much greener from here than from either of the other visited vantage points because I was looking more squarely down on the city where more grass was visible verses from the side of the city where more stone wall is seen. After all the climbing around, my legs felt like jelly. I signed out at the sub-gate and started strolling through the residential part of town until noonish when I was due to meet with Dave and Rob at the main gate. Dave was doing better, but Rob was just holding on. After a sit in the shade and some snacks, Rob opted to head back down to town to rest while Dave and I ended up exploring a small trail on the far side of town from Waynapicchu that lead to the “Inca Bridge”. This was another nice walk along the steep slopes and through the lush vegetation to a small bridge along a rock wall to continue the very trail we were walking on, though it was impassable. It really became more of an exploration of the features on the peripherals of town more than in the town itself. If I ever get back here I’ll be keen to hire a guide to walk me through the particulars and tell the stories of this amazing place. On our way out, Dave and I just happened upon some of the llamas that are free to roam around the city and as I started taking photos, sitting on one of the walls, the llamas got closer and closer to me. I think I got some neat shots. With Rob feeling how he was and Dave still a bit on the mend, we opted to push our Ausangante trek departure back a day and take a rest day in Cusco. This was a really good idea regardless of how folks were feeling. To just have a 24 hour turnaround for a trip as big as Ausangate would have been pretty hectic.